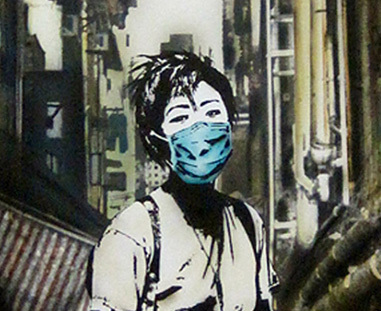 Eddie Colla’s stencils depict scenes of oppression, vandalism, and rebellion. It encourages you to peer into these landscapes and question the onslaught of the advertising which we’re forced to confront on a daily basis, the stuff that his work defies. We caught up with Eddie after his trip to Hawai’i earlier this year, to talk the street art vs graffiti debate, the role of stencils in the urban environment and why he’s not planning anything huge for 2012. So you’re a thief. What do you think of that? It’s better than being a liar. How did you get into stencilling? I had done stencilling when I was younger, but I worked primarily as a photographer for a long time. I studied photography back in the day, when it was all film and printing and chromes. As photography steadily and rapidly moved forward into the digital realm, I kinda wanted to move the opposite way. I took images and started to reduce them, simplify them, make them cruder, rougher, less polished. I think when I started taking photos, I was always trying to make things sharper, crisper and optically better than we see. At a certain point, you hit a wall creatively and there’s nothing left to do but start taking things away. It’s still photography really, just a stripped down version. Have you ever received any feedback from the mainstream graffiti community, regarding the legitimacy of stencilling? Not really. I mean I know plenty of writers, but when we talk it’s not really about legitimacy. It’s usually more about everyone getting their stuff to the place where they want it visually. Street art vs graffiti: what’s your opinion? My opinion is that the world would be a miserable place if things were as simple as declaring the victors and the vanquished. Pop art vs. abstract expressionism? Baroque vs. punk rock, say, Vivaldi vs. Steve Albini? Who would win? To declare an entire art form or genre better than another would be to simply dismiss a lot of talent. I’m not sure what there is to gain from this question. Pitting one group of creative people against another seems to only constrain creativity. How did you get involved in Pow Wow? I know Ken Harman from Hi Fructose, he was there last year. He put me in contact with Jasper and Jasper invited me. It was the most positive experience I’ve had in a while. To be around all that talent, watching everyone work, seeing different perspectives, watching the whole Kaka ako neighborhood transform in a matter of days. The whole thing was just super inspiring. Different things, but somehow I think, in one way or another, it’s all about not succumbing to fear. What do you think defines stencilling, as a culture? I don’t like defining cultures, it inhibits their progress. What do you say to young people trying to do what you do? I hope you’re not doing it for the money. What’s coming up this year? Will 2012 be a big one? Well, the world is supposed to end this year so I probably shouldn’t plan anything too big or I’ll just be disappointed. I have some public art projects planned and a collaborative show with D Young V and Hugh Leeman at Hold Up Art in Los Angeles. I just did a print release with 1Xrun.com and there will probably be more of that to come. I’ll also continue working with fiftyseven-thirtythree.com on apparel stuff. Your piece, If You Want To Achieve Greatness, Stop Asking For Permission is a favourite. Where did the inspiration for this come from? It’s just about controlling your own destiny. If you make your success contingent upon the approval of others, you’re setting yourself up for failure. Do you think people have an idea of what your work is all about? I think people for the most part understand what I’m doing, so from that standpoint it’s successful. I can’t say everyone agrees with me, nor would I expect them to. In the context of an urban environment I think my work certainly creates more dialogues than say an iPad2 or a Bank of America ad. Find more of Eddie Colla online via Tumblr, Facebook and Twitter.